The earliest GAA team in Drumlane was the Drumlane Owen Roes. It was one of the first G.A.A. clubs founded in Co. Cavan and it affiliated to the County Board on January 22nd 1888. It held its first tournament at Milltown on St Stephens Day 1889 and 1890. Its first secretary was Phil Leddy, Ashgrove, Milltown, and the first delegates to the GAA County Convention were Francis Fitzpatrick and T. McDonald. They even had a separate juvenile team, The Drumlane Regulators. Owen Vesey (goalkeeper); Jimmy Hanlon, Cornaleck (capt. ); Johnny Hanlon, Cornaleck; Mick Fitzpatrick, Derryvona; Willie Fitzpatrick, Greathill; Frank Fay & Pat McCabe, Coragh; Hugh, Tommy & Terry Maguire, Coragh; John James Fitzpatrick, Caldaragh; Frank Reynolds, Brankfield; James Kennedy, Quivvy; Peter Fitzpatrick, Quivvy; Paul Fitzpatrick, Quivvy; Terence Fitzpatrick, Quivvy; Frank Blessing, Cornaleck. The clubs delegates to the County Board in 1888 were Francis Maguire, Tullyanogue (the clubs secretary) and William Fitzpatrick. Their practice grounds were at Great Hill. They made their debut at Butlersbridge on New Years Day, 1889. Although this team did not achieve much success at County Championship level, they were formidable opponents. Drumlane really came into its own after the resurrection of the G.A.A. in the county in 1903, winning the senior championship four years in a row (1903-6). These early years were also marked by tragedy, as in 1903 when Danny Flynn died from injuries he had received in a game in Cavan. 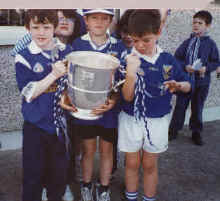 Players from Drumlane have frequently had a starring role on the county team. These have included Sonny Magee, who played on the first Cavan team to win the All-Ireland championship in 1933, and T.P. Reilly who played in the celebrated Polo Grounds final of 1947 in New York, when Cavan defeated Kerry. In 1936 Drumlane defeated Cornafean to win the Junior Championship, while in 1948 they regained the senior county title after a wait of many decades. In 1972/3 they won the Minor Championship and in 1971 they also won the Junior League and Championship. From the 1980s to the present day Drumlane has had great success at under-age level, especially in U/12 and U/14. It will be difficult, we know. The 'Bridge had better stay clear. We're glad to be told. Will dazzle them with speed. We will win for sure. CAMOGIE has been a popular game in the parish down the years, and like football, it has been through its good and bad patches. Periods of inactivity have been followed by an upsurge in activity, only to be followed by a new era of dormancy. It is interesting to note that during the period 1933-36 the team trained and played their home matches at The Grassyards, Lower Drumlane. On one occasion when a fixture had to be fulfilled and the Daughters of OConnell (as the team styled themselves) were short of a player, they dressed up a man in ladies attire. They won the match! (a song was made up about the exploits of these ladies but the words have disappeared. It was commonly alleged that junior players, often appeared very mature for their years... but never in Drumlane. Fron row (l. to r.) Jane McGuire, Maisie OReilly, Tessie Farrelly, Rita OReilly. Back row: Rose Ann McKiernan, Anne McGurren, Kathleen OReilly, Mary E. McGurren, Brigie Rudden, Kathleen Rudden , Maggie Farrelly. Drumlane Ladies Football Club was founded in May, 1980. The team has always had a broad reservoir of talent from which to draw. One player of the early 1980s, Angela McCabe, not only played for the countys womens football team but was also picked for the Irish womens soccer squad. The game of Skittles has a long history, and local lore says that the game was first played by the monks. As long ago as 1918 there were no less than six teams inn the parish, as teams were organised by the Townland. Games were often played at crossroads for prizes such as a quarter barrel of beer. In the 1970s the game was reorganised at both local and national level. In 1972 team from Corglass won the Fisherman's Cup, the equivalent of a county championship in Skittles. In 1976 a team from Corglass, Drumlane won the first All-Ireland championship at Mitchelstown, Co. Cork..